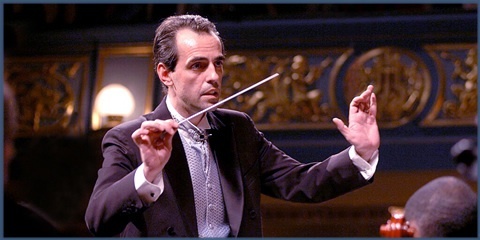 Maestro Edin Dino Zonic is a world acclaimed conductor, composer, and director, born and raised in the Olympic city of Sarajevo, in the area of the world known as Bosnia and Herzegovina. But, the Sarajevo of Dino’s youth, once hailed as one of the world’s most beautiful cities, did not remain so. The ravages of the war and aggression would terrorize the people and scar this once proud capital. The war profoundly affected the course of Dino Zonic’s life and career. This life-altering experience would inspire him to dedicate his work to the service of music that bridges cultural, national, and religious barriers to bring a universal message of unity and hope to all people. Named as Cultural Ambassador of Bosnia and Herzegovina, he became the Balkans’ most prominent composer, conductor, and director with the objective to inspire the human spirit to action. During the war in 1993, Dino Zonic began to compose CIRCLE, his highly acclaimed majestic musical, which played for four years in sold out concert halls in Europe and the United States such as: “Theatre an der Wien” Vienna-Austria; City of London Festival;“Irish Art Center” Broadway-New York; “Vatroslav Lisinski” Concert Hall, Zagreb -Croatia; “Schuster Performing Arts Center” Dayton-Ohio etc.. The powerful music, words, and movement of Circle rose from the tragedy of war, and have left a lasting impression upon thousands of audience members throughout Europe.